A couple weeks ago, we spent a (too) quick weekend in Peoria, AZ for Seattle Mariners spring training. I booked this trip for my husband and daughter who are huge baseball fans. To ensure there was something for everyone, I worked with Visit Peoria to outline a fun family weekend that we all could enjoy, complete with a unique boutique hotel and lots of great meals and family fun in the sun. Peoria is a welcome and unpretentious way to spend an affordable weekend complete with lots of warm Arizona sunshine, palm trees, and pampering. HINT: Mother’s Day is coming up and this Hip Travel Mama trip itinerary has a little something to pamper mom, and have affordable some family fun in the sun. Sample some brews and lunch at Peoria Brewing Company. Owners Todd Hayes and Christian Payne want you to know that they don’t just brew beer. They brew “liquid awesome.” The tap room, food, and beers exude awesomeness and with beer names like “Naked Jane,” “Yippy IPA,” how could you go wrong starting off your vacation with local craft brews? Check in to this historic luxury hotel, The Wigwam Resort. In 1929, The Goodyear Tire & Rubber Company opened “The Wigwam” as a guest ranch. Today, this luxury resort celebrates it’s long history and has a mid-century vibe with a contemporary twist. Located off the hustle and bustle of the busy highways of West Phoenix, this property exudes historic elegance and is an active family’s dream with a huge tennis center, 54 holes of championship golf and lots of family friendly fun at the pool. The Wigwam has a variety of room types for couples and suites for families. We had an impressive one bedroom suite with a pull out couch that overlooked the Tennis center and spa. And don’t forget the Spa! While I didn’t have time this trip, The Wigwam has an impressive 26,000 square foot Elizabeth Arden Red Door Spa. Dreamy. Check the Wigwam’s special offer page for the latest deals. (Tip: As of this posting, I searched for Mother’s Day weekend and the Wigwam still has a bunch of rooms available starting at $149-259/night, with suites going for $300 including a $50 resort credit). 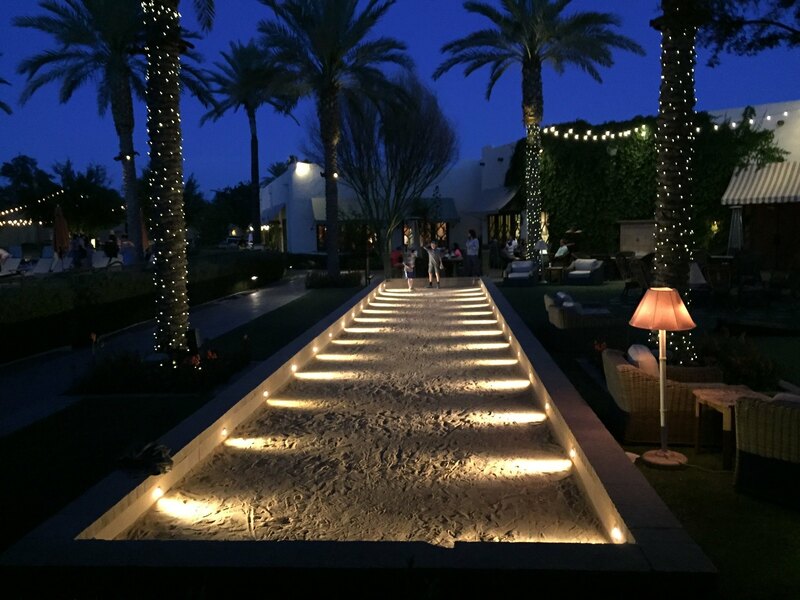 Farm to table dinner and after dinner bocce ball at Litchfield’s in the Wigwam Resort. The Litchfield’s menu looked delicious, but we were absolutely blown away by our outstanding dinner. Chef Rich Hinojosa’s kitchen is an open airy retreat with an outstanding wine list. All of the dishes on the menu were sourced from Litchfield’s own Farmer’s Market and organic Chef’s Garden and paired with delicious wines. The filet minion steaks we ordered were fired in the open kitchen on an open flame over pecan wood, giving the meat a smokey and earthy, melt-in-your-mouth flavor. We topped off the dinner with goat cheese cheesecake and chocolate molten cake and an after-dinner bocce ball game. Divine. Breakfast at Haymaker Restaurant. The next morning was a little too early for Whiskey (Haymaker is known for its impressive selection of whiskeys), and we met up with Jennifer Stein at Visit Peoria for a hardy, morning breakfast at The Haymaker Restaurant. The Haymaker is locally owned, and known for its casual and unpretentious dishes. Some must dos on the menu include the signature Haymaker Bene or American Waffle. Yum. A guided tour of the Challenger Space Museum. I remember vividly the day the Space Shuttle Challenger perished. I was sitting in the classroom in school with my young peers, watching on the tiny roller cart. The Challenger Space museum honors those astronauts lost that day, and is an immersive experience to teach kids about the Challenger, science and space exploration. The guided tour took us about an hour and the space museum also offers kids camps and class field trips where kids can put on a mock launch, complete with mission control instruction. Take a hike. Visit Peoria has a list of great family friendly hikes just a short drive from Peoria. Deal shop until you drop. The Tanger outlet mall in Glendale are just right off the freeway. I love me some outlet shopping! Go wild at the Wildlife Zoo and Aquarium. This Wildlife park is close to the Wigwam Resort and Peoria, and has Arizona’s largest collection of exotic and endangered animals, with more than 600 separate species, rides, a petting zoo and daily shows. Spend a day at the lake. Lake Pleasant is about 25 minutes north of the city of Peoria and is a fun outdoor playground for families. Here you can spend the day paddle boarding or rent house boat at Lake Pleasant Houseboat rentals. Who knew there was so much to do besides baseball at spring training in Peoria? So get on this warm weekend getaway before the weather gets too hot, or bookmark this one for next spring break and spring training for your favorite team. We can’t wait to go back next season. Disclosure: We paid for our own airfare and related travel expenses for this trip, but received complimentary accommodations and park tickets during our stay. As always, opinions here are our own.